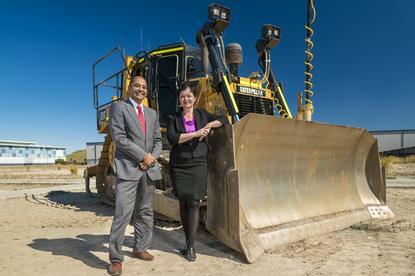 Krupal Raval, CFO APAC, Digital Realty, and NSW MP Tanya Davies, minister for mental health, minister for women and minister for ageing, at the site of the new data centre. 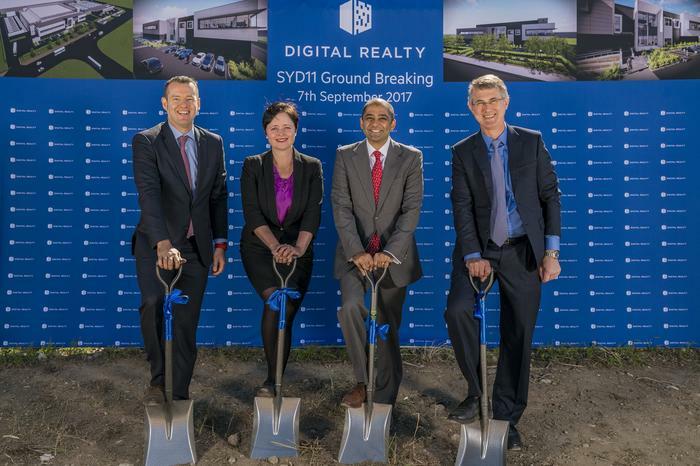 NYSE-listed Digital Realty has broken ground on a new Sydney data centre at Erskine Park. The new Sydney 11 data centre — SYD11 — will be adjacent to the company’s existing SYD10 facility. The company also operates a North Ryde data centre, SYD12, and two data centres in Melbourne (MEL10 and MEL11). The decision to build a new data centre is a product of the high level of utilisation of the company’s existing facilities coupled with the fact that a number of Digital Realty’s global top-tier clients are looking to grow “in a very big way” in Australia, the company’s CFO for APAC, Krupal Raval, told Computerworld. The 16,360 square metre SYD11 data centre will offer 14 megawatts of power. Peter Adcock, Digital Realty’s APAC vice-president, design and construction, said that the data centre would use the latest economiser units from Vertiv for cooling. “Their pumped refrigerant economisers are giving us a PUE of about 1.35 for this site; so that is without using any water and it gives us a high level of resilience with a very granular performance,” Adcock said. Construction of the building is expected to take around 12 months and employ up to 500 local contractors, Digital Realty said. “This building was originally designed and permitted to be built in two phases; however after discussions with the pipeline of potential tenants and also the builders, we’re probably looking to build the shell of the whole building all at once and then we’ll fit out the internal modules,” Adcock said. The facility will be based on Digital’s Turn-Key Flex PODs (‘performance optimised data centres’). After that there is around a 20-week turnaround for PODs, which Adcock said was thanks to Digital’s global approach to procurement, with its strategic vendors having stock ready for the company. Adcock said that because SYD11 is adjacent to SYD10 in Erskine Park there are already conduits at the boundary of the existing facility ready to connect to the new data centre, so there won’t be any delay waiting for new fibre to be rolled out. “We can leverage off the back of Sydney 10 and get immediate connectivity to half a dozen different carriers,” he said. Raval said that once Digital Realty’s merger with DuPont Fabros is closed off, the company would have an enterprise value of US$34 billion — “which would make us one of the 10-largest real estate companies in the world,” the CFO said. That scale delivers cost of capital advantages and Digital has a $2 billion line of credit allowing it to deploy capital into a range of markets around the world, Raval said. In Melbourne the company already owns a land bank adjacent to MEL10 and MEL11 that can support future expansion. “To put it into perspective: The land that we’ve got at MEL12 would enable us to do a similar size as Sydney 11, which we think of as our ‘second generation’ in Australia,” Adcock said. Omer Wilson, senior director of marketing APAC at Digital Realty; NSW MP Tanya Davies; Krupal Raval, CFO APAC at Digital Realty; and Peter Adcock, VP design and construction APAC at Digital Realty.